Discover the beauty of Lake Ashi and Kamakura with Seafood BBQ lunch on this 1-day tour from Tokyo! The tour departs from Shinjuku in the morning, and heads to the initial destination, Lake Ashi. Board a short cruise at the lake with a pirate-themed ship, observing the beautiful combination of Mt. Fuji and the lake while cursing around for pirate-inspired props. All-you-can-eat seafood is just what you need to recharge your batteries before a walk around Kamakura: visit Tsurugaoka Hachimangu Shrine in your free time and a leisurely stroll around the lively dining and shopping street Komachi-dori, before going back to Tokyo. 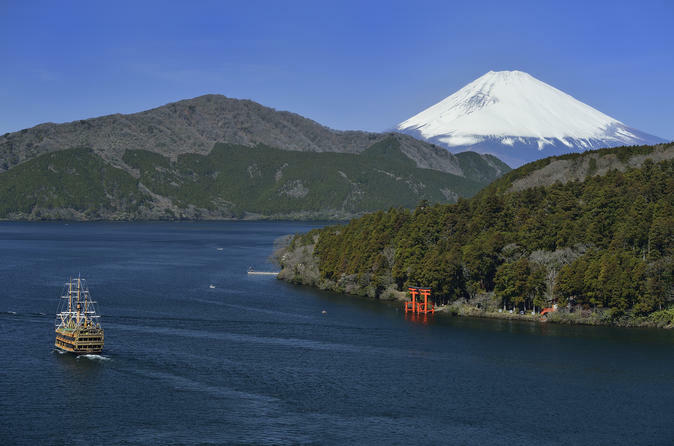 On the day of the tour, meet your tour conductor at one of the Shinjuku pick-up locations then board on the tour bus to the first destination, Motohakone where Lake Ashi is located. You will take a short cruise on a "pirate ship" that is decorated with pirate-related props scattered aboard. Enjoy the Mt. Fuji view from the lake as it is a perfect combination of the mountain and the lake. The cruise will be around 30 minutes. After the morning sail, get your feet back on dry land at Togendai Port and ride the bus for lunch at Amagoya restaurant in Chigasaki. There, an 80-minute seafood buffet lunch awaits you, and you will be able to select your own seafood and cook it at your own grilled-equipped table: choose among various kinds of delicious dishes, including shrimps, turban shells, crab, curry or noodles. Once you’re recharged, re-board the bus, this time to Kamakura. You will have around 2 hours free time in the area. Visit the Tsurugaoka Hachimangu Shrine, Kamakura’s most famous Shinto shrine dating back to 1063 and also take advantage of around 250 shops and cafes lining Komachi-dori street. When time’s up, the bus takes you back to Shinjuku, where arrival is expected around 18:00.